Gravity Ball, the Battery Effect, StickUp, and Artemus Labs will present their business plans to judges at the April 12 Innovation Challenge Awards Ceremony. The top team will receive up to $50,000 in cash and business services. The judges are Alexa Fleur, president and founder of CritiqueIt; Mike Niggli, former President and COO of San Diego Gas & Electric; angel investor Joe Platnick; and Studio One Eleven Founder Alan Pullman. The Battery Effect team is headed by Alexander Galasso, who graduated from CSULB with a marketing degree in fall 2017. Team members are software developer Leon Smith II; Abhishek Manjulagodu Basavanna, who is working on a master’s degree in aerospace engineering; and Madison Simon, a CSULB marketing major. The Battery Effect is an intermediary household battery recycling company that specializes in developing education, collection, and recycling programs for municipalities, K-12 schools, as well as public and private universities. The Battery Effect is based in California, with goals to expand operations nationwide, beginning with the implementation of recycling programs close to home in Long Beach, California. The Gravity Ball Health Systems team is led by Vandana Vaswani, who is in CSULB’s MBA program. The health and wellness startup has developed a new method of doing resistance exercise that uses an invention called the Gravity Ball. The Gravity Ball was invented by Dr. Mark Chavez, the company’s president and chief health officer. Nicole Tolmie, who holds a bachelor’s degree in cultural anthropology from University of Washington, serves as Gravity Ball’s business and content manager. Irene Luna Guzman is the company’s strategic adviser. The Gravity Ball lets users to do a variety of resistance exercises that correct weaknesses and imbalances throughout the major joints of the body. Many are based on principles from yoga, tai chi, gymnastics, dance, and Pilates. StickUp is led by founder Bryan Amburgey, who also founded two other augmented reality startups, ARLB and ARTV. Team members are CSULB graphic design majors Samantha Surtandi and Annie Lee, and video editor Sam Maliszewski. StickUp allows users to create augmented reality targets at their home, school, or favorite coffee shop/bar, and then anyone with the app can add content to those targets like selfies, videos, 3D text, and more. The app is currently available in the Apple and Google Play stores. The fourth finalist team, Artemus Labs, is co-led led by Calvin Leung, a CSULB marketing and management information systems major, and Rae Jillian Rivera, who is studying electronics engineering technology. 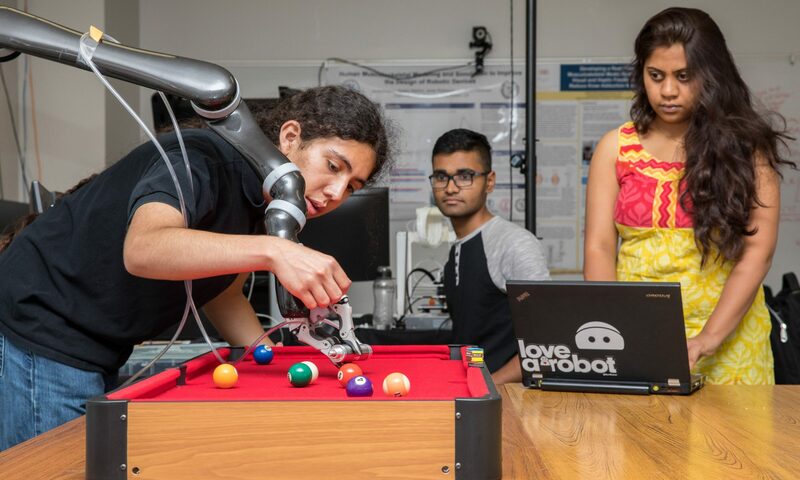 Other team members are CSULB students Anna Maria del Mundo, management information systems; Nikki Escobar, industrial design; and Kimberly Ventura, aerospace engineering. This will be Leung’s third time being on a finalist team. Previously, he was a team member of 1010 Innovation, which proposed a mobile app that would help caregivers look after elderly family members. The company was an Innovation Challenge runner-up in 2017 and 2016.